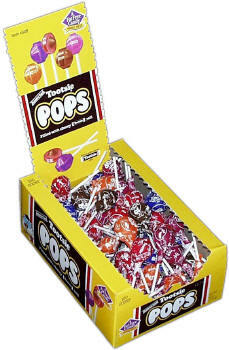 Tootsie Roll Assorted Pops 100ct - But the eternal question is still unanswered – how many licks does it take to get to the center of a Tootsie Pop? Tootsie Pops are individually wrapped suckers filled with chewy Tootsie Roll. Flavors may include Cherry, Chocolate, Grape, Orange, Strawberry, and Watermelon as the assortment is packed by the manufacturer in their factory. They may even add a new flavor to the assortment without telling us!